The Luodong Sports Park is a complex park that began constriction back in 1986. After seven years and a ton of detailed constructions, it was officially opened to the public in 1996. The sports park has a total land area of 47 hectares and is divided into three different themes: Oasis, Aqua and Health zones that integrate landscapes, plantations and amazing sceneries into sports facilities. The entire design of the Luodong Sports Park is a combination of the local distinctiveness of Taiwan and the specialties of the Yilan County. The park features a large green area with distinct architectural structures that provide an excellent place for outdoor leisure and relaxation. The park is filled with a ton of options to do. Of course, there are a number of basketball courts and a few tennis courts available. If you are lucky, you’ll be able to use their swimming pools as the pool is only open in May and close at the end of August. There are two pools found in the park. One is an Olympic- sized pool while the other stretches to 25-meters long. Entrance to such pools requires a certain fee but remains relatively cheap for a one-day pass. Other sports facilities include a soccer field, a baseball field, a track and field stadium, a croquet stadium, a skate road and a lot more. It seems like the Luodong Sports Park has a certain sport for everybody to enjoy. Those who are not the sporty types can enjoy the park as much as sports lovers do with the beautiful green sceneries of the park. See Taiwan acacia, bischofia polycarpa, taxodium and many other types of plants that are scattered all over the sports park. Little kids will especially have fun feeding the gigantic koi found in the lake of the park. Fish food can be bought at nearby stalls in case you forget to bring your own. By night time, see the fountain found in the center of the lake lit up by colorful lights while you are being serenaded by timeless melodies all throughout the park. The Luodong Sports Park is a frequent hang-out place for locals, which is why five spacious parking lots are ready to accommodate Yilan locals on a daily basis. 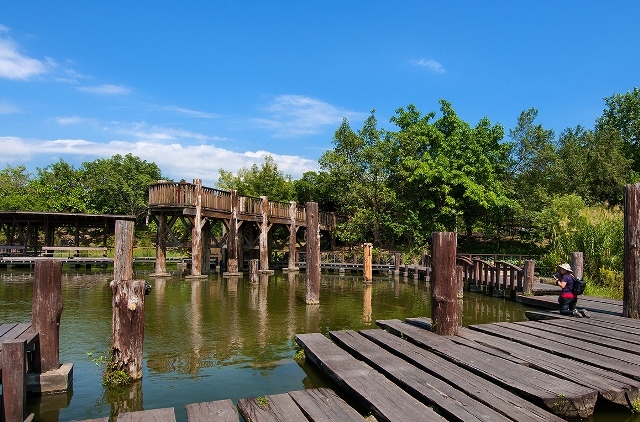 Yilan tourists can also enjoy the facilities of the Luodong Park by taking public transportation to get there. Make sure to take the train to Yilan Luodong Station and then ask a cab driver to take you to the sports park. Taxi drivers will undoubtedly know this place so you won’t have a hard time finding it. The Luodong Sports Park is quite a popular tourist destination in Yilan which is why if you choose to stay overnight nearby, you might have a problem finding accommodations. Add the fact that the equally popular Luodong Night Market Food and Restaurants to Try When Eating and Drinking in Yilan is but a mile away, hotels around the area are almost always fully booked. With the enriching green landscapes, amazing architecture and a wide variety of sports facilities, the Luodong Sports Park is a wonderful attraction that provides great activities for those who visit it.